Ever wondered how hard it was for people to make stone tools? Do you want to give it a try? If so, this is a great workshop for you. Justin DeMaio, BLM Archaeologist and skilled flintknapper (stone tool maker) will be providing a demonstration and hands on workshop. Justin will show you techniques he has learned and guide you as you try them yourselves. This workshop is limited to 10 people to ensure adequate assistance. 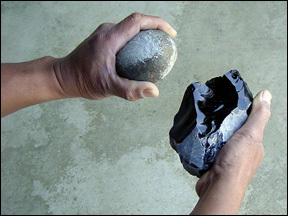 Obsidian is a great stone for tool making. It can be extremely sharp and has glass like qualities. We will provide all attendees protective eye-wear and leather for their hands and laps. If you have preferred eye wear and leather gloves, please bring them with you. Participants will be able to take their creations home with them. There is a $15.00 materials fee per person. or you can email your RSVP to info@nvfcp.org and bring cash or check with you. Checks should be made out to Nevadans for Cultural Preservation. Third building from the road.